GT Radial Champiro 228 - the first car tyre to be licenced as "Choice Recommended"
Choice is Australia's leading independent consumer organisation committed to ensuring the consumer voice is heard loud and clear. Choice empowers consumers to get the most out of their purchasing decisions by providing a mix of advocacy and advice. 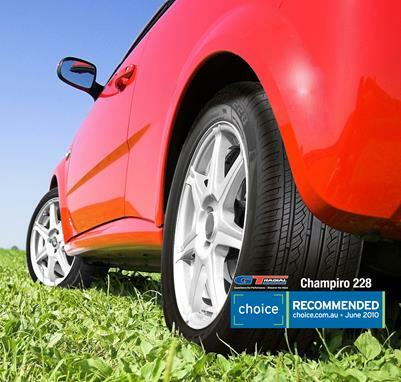 GT Radial Champiro 228 premium comfort touring car tyres underwent extensive testing and are now recommended by Choice for their emergency braking and cornering performance results. In a field of fifteen tyres, GT Radial was honoured as one of the best in the "What to Buy" section of Choice. As Choice states, "cutting corners is not an option when it comes to safety and your car tyres". The all new GT Radial Champiro 228 with Nanotek silica provides excellent grip in all conditions, superior driving comfort, minimal road noise and reductions in fuel consumption, thanks to less rolling resistance on the road. The tyre's advanced variable pitch design ensures that all passengers experience a safer, quieter and more comfortable ride. Motoring legend and four-time Bathurst winner, Allan Moffat agrees with the Choice recommendation of GT Radial Champiro 228 car tyres, adding that " GT Radial are streets ahead of other tyres positioned in the same price bracket. When it comes to performance, GT Radial tyres are on the money." GT Radial Champiro 228 outperformed other more expensive tyre brands, with cornering performance in particular separating it from its competitors. The GT Radial Champiro 228 tyre also features a nanometer carbon structure which reduces heat generation, extends mileage and ultimately provides exceptional value. GT Radial tyres are the only tyres in Australia backed by a free 5 year tyre replacement guarantee, Drive 5ive which provides ultimate peace of mind during the life of your tyres. GT Radial produce tyres for cars, 4 wheel drives and most commercial vehicles. Typically in the event of a product defect other tyre manufacturers offer only a pro rata refund, however, GT Radial is so confident in its product that it offers a 100 percent free tyre replacement guarantee. Seek out your local independent GT Radial tyre dealer at www.gtradial.com.au or by calling direct on 13 62 82. GT Radial tyres are imported and distributed by Tyres4U, the leading independent, Australian owned and operated tyre wholesaler. There are over 200 independent tyre service centres and selected car dealer service centres across Australia - all trained and authorised to sell, fit and balance GT Radial tyres. GT Radial Champiro 228 tyres are available throughout Australia in 17 sizes, for 14" to 18" wheels, for all popular makes and models including: Holden Commodore, Ford Falcon, Mazda 3, Toyota Corolla, Toyota Camry, Toyota Aurion, Honda Civic plus many more car makes and models. GT Radial Champiro 228 choice recommended.